In late September we went on a moderate juicing fast (I’m not really sure why the “Reboot with Joe“ plan is called a Fast, you aren’t really fasting… but that is the term they use, so I’m using it here). Our fast was about 7-10 days and involved replacing 2 meals a day with fruit & vegetable juice (a modified version of Joe’s Mean Green, as well as other juice/veggie combinations) – and – we both benefited. It helped Dave a little, it helped me A LOT. Prior to our modified juice fast I was unable to eat apples – in any form, as they caused me great and horrible pain and oranges made me nauseous. Living with Gastroparesis kinda bites. But anyway, since our short moderate juice fast, I can now eat an apple – even with the skin on it – and enjoy it. No pain. No bloating. Nothing but the sweet success of eating something I love. It’s crazy. But it’s real. I can also have an orange. These are major steps for me so this is why I mentioned juicing is something we aren’t going to forget. The only thing is… it’s time consuming. And very expensive. To create a pitcher of juice (roughly 4 servings), it takes about 20 minutes and you turn about a week’s worth of produce into four meals, or two meals for two adults. As I mentioned, it’s extremely expensive. But the thing is, so is being sick. All in all, Fat, Sick & Nearly Dead is a very inspiring documentary and if you want to give the fast a try, it’s definitely worth doing. Everyone who has done it talks about how difficult the first three days are, but that is because most people go into it straight from eating the Standard American Diet. If you have already cut sugar from your diet, and wheat, you may not have any trouble at all – because you’ve already gone through those withdrawals – which are really what makes the fast difficult. For us, it was mostly a breeze. It also actually made our move easier because instead of trying to eat traditional (home-cooked) meals while we went through a stressful move, we were almost on a full liquid diet – which is much easier to digest during times of stress! 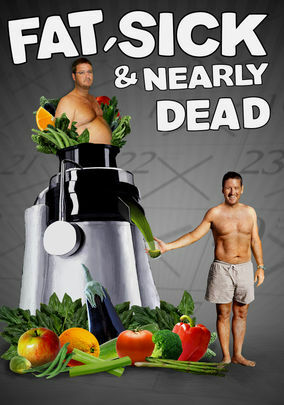 I definitely recommend watching Fat, Sick & Nearly Dead for anyone interested in improving their health! If you have Netflix, here are the links: Fat, Sick & Nearly Dead 1, and then of course, Fat, Sick & Nearly Dead 2. Just be sure to watch the first one – first!